The design of the new trucks focuses on delivering class-leading payload, high reliability and simple serviceability. The AC powertrain of each of the two new trucks draws from the Cat 795 AC and Cat 794 AC, which have been operating successfully for about 5 million hours. Cat AC electric drive is developed and manufactured by Caterpillar, the single source for the entire powertrain. 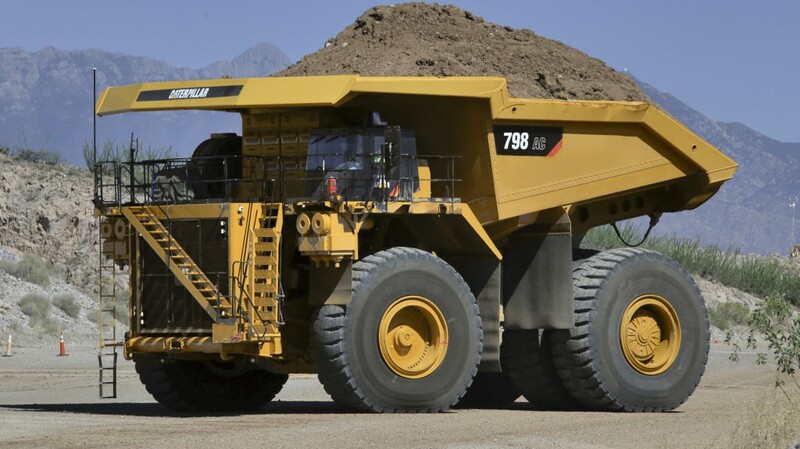 The Cat High Efficiency (HE) Body is sized and configured to meet the specific needs of the mine, dictated by fragmentation, abrasion, cohesion and the loading tool. The new trucks feature four-corner, oil-cooled disc brakes as well as dynamic braking for stable handling and fast stopping. Superior retarding capability, blended braking and the Cat Traction Control System help boost productivity while enhancing safety. The Cat AC drive is a high voltage system (2,600 volts) that operates at lower current than most competitors' systems. When combined with full integration of the power train, the result is lower heat generation, smaller and lighter components, and longer component life.